Taylor-Hobson are lens and precision instrument manufacturers based in Leicester, England. 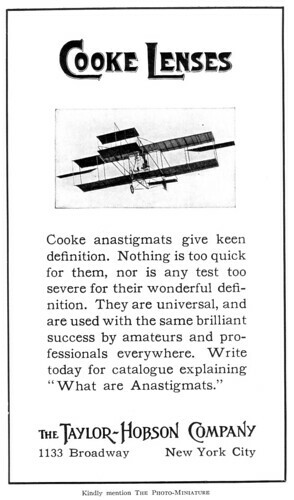 The company was founded as T.S. and W. Taylor in 1886 by engineer William & optician Thomas Smithies Taylor. In 1887, W.S.H. Hobson joined the company. In 1893 they produced their first Cooke lenses, designed by H. Dennis Taylor (no relation to the company founders) - optics manager of T. Cooke & Sons, York. Taylor was attempting to eliminate the aberrations at the outer edge of lenses, and in 1893 patented the Cooke triplet design (British patent no. 1991). Manufacturing rights were offered to Taylor, Taylor & Hobson, as the company was then known. 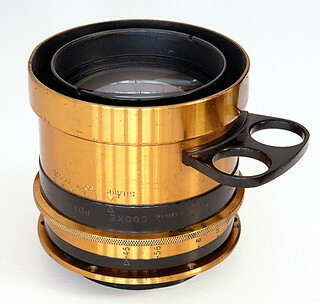 In 1932, the first Cooke zoom lens was introduced for cine applications. Around this time, Taylor, Taylor and Hobson was part-owned by Bell and Howell. By 1939, Taylor-Hobson claim to have produced over 80% of lenses for film studios across the world. Like much of the British photographic industry, the company became part of Rank at some time in the '40s. The company still exists, making lenses and lens measurement equipment, bearings, instruments and medical replacement joints - among other precision items. It is currently part of the US-based Ametek, Inc. The separate lens company, Cooke Optics, also still exists in Leicester. T-H lenses may be dated from their serial numbers. Taylor, Taylor and Hobson also made Talykron shutters that some of these lenses are mounted in. ↑ 2.0 2.1 Company information at Early Photography; the notes cite Rudolf Kingslake's History of the Photographic Lens (1989), Academic Press. ↑ Applications at the Taylor-Hobson website. ↑ Cooke Telepanchro 16 inch (406 mm) f/4 adapted for Nikon F mount, c1960, sold (for €2160) at the 20th Westlicht Photographica Auction, on 1 November 2011 by Westlicht Photographica Auction in Vienna. ↑ Consisting of the lens barrel with rear element and four interchangeable front elements engraved W.A.R Front, R.R. Front, W.A.R. Back, and R.R. Back. The lens barrel has a built-in iris diaphragm near the front, and is engraved 'EQ.Foc 3in'; 'EQ. Foc 3.34.in' and 'EQ. Foc 5.4 in' with three sets of aperture settings marked 'W.A.R.,' 'R.R.,' 'and 'R.V.' (Seen in an on-line auction Jan 2014). This page was last edited on 18 July 2017, at 05:09.